A modest reversal of Bush's last-minute anti-ESA regulations is advancing Swine Flu Outbreak — Nature Biting Back at Industrial Animal Production? The Governor has vetoed SB1175 leaving SB1232 in its place. Presumably SB1232 will pass the legislature and the Governor will sign it into law. How much valuable time has been spent on this issue by the legislature, state and Federal agencies, interest groups and the Governor? Is this the best use of time in this failing economy where education, public health, and other budgets are being slashed leaving behind dysfunctional important agencies and programs? Vaccine for Children, coverage for cystic fibrosis patients over 18, and adult and travel immunizations are but a few examples of programs that have been cut. These programs actually save lives and these cuts will inevitably result in more illness and premature deaths among our most vulnerable citizens. Sheep industry officials are admitting that if they are held accountable for their actions and how they treat public lands and wildlife, they will go out of business. Their operations are not viable, so as it is – without all the subsidies – they would collapse. The changes made that appear in the new bill SB1232 are smoke and mirrors. These changes do not address the real on the ground situation where bighorn sheep, especially rams, travel widely throughout the region and intermingle with domestic sheep then go on to intermingle with other bighorn sheep. This can go undetected due to poor management practices by the herders who often don’t understand the situation as they are immigrant laborers who can’t even speak English. This is not to say that these herders are in any way responsible for the situation but to say that many times they are just put in an untenable situation. This also doesn’t address the issue of straying or lost sheep. Many times herders return from the season and unaccounted sheep are left behind on the range. These sheep may end up in bighorn sheep habitat. These situations have been documented on numerous occasions. Thanks for your insightful analysis of this issue. Keep up the good work and for keeping us informed. Yes, the only reason these sheepmen are in business is the absurdly low public lands grazing fee ($1.35 a month covers the cost of grazing FIVE sheep and their lambs) on our public lands. Think of it. Thirty-three cents a month is the “fee “the ranchers pay to BLM and the Forest Service for the allowing their domestic sheep to trash our watersheds and make wildlife die. Plus the subsidies like Ken listed above, and the complete lack of ACCOUNTABILITY they have had to take for their actions on public lands – up until now. Especially in Idaho. Larry Craig bent heaven and earth to weaken, dilute, and tweak environmental laws and beat up on BLM and Forest Managers and biologists so that the public lands livestock industry would not have to be held accountable for their actions. The fifteen or so large sheepmen in Idaho were particularly dear to Larry. But you know, on the bighorn disease issue, the Forest Service was moving forward, under cover of the federal court Payette Forest litigation brought by Western Watersheds Project, Hells Canyon Preservation Council, and some others, in the latter days of the Bush administration, to develop actions to manage lands based on the clear science on disease transmission. Unfortunately, the NEW BILL (which is just Siddoway’s original Bill with a couple of parts taken out) in front of the Legislature has MANY BAD PROVISIONS, and was based on Woolgrower lies about, and denial of, disease transmission to the Legislature. The new Bill would act to restrict bighorn sheep to only “core” areas, and the Woolgrowers think they can very much control how Fish and Game defines “core”. And they are likely right – as Fish and Game under Otter has increasingly become a handmaiden of the livestock industry – for example – planning to zero out wolf packs anywhere public lands grazing occurs. That’s not science-based management, that is mgmt based on what industry wants. The new Bill allows the Woolgrowers to get Fish and Game to take their side in closed door meetings with agencies where the public is not present. The local media, seeming to carry dirty water for the livestock industry over the years, has recklessly muddied the disease issue – by giving some credence to sheepmen lies that contact with domestic sheep did not cause bighorns to die. As if it was an “unsettled” question – and is not and has not been. Media has also not reported the truth about the economics of public lands sheep ranching – and has not exposed the myths there, too. Let’s have honest reporting on how much of a funding and administrative drain on everyone these ranchers really are. KT, I agree that the local media has dropped the ball on this – and was very disappointed with the Letters from the West article that Ken posted just earlier. I think Rocky knows better and would expect more of him. It’s the same muddied-waters industry science PR junk that Barker has been critical of on global warming and I think that he should take greater responsibility to fact check given this is his beat, his backyard – if you will. We’re fortunate to have this forum, and I’m fortunate to contribute. I’d almost like to see Otter have passed the bill – I think it would have expedited removal of diseased domestic sheep at the federal level and I think that is what it’s going to take to protect bighorn sheep in the long run. Maybe they’ll go with the no-domestic grazing on the Payette Alternative anyway – we can only hope. I do no trust the working-group “collaborative” as I attended it last year and understand that it was operating under the political pressure of legislative remedy anyway – that affected the outcome. I don’t trust some of the conservation representatives to hold to the science – though I’d like to be surprised – and I know so long as Ken and KT attend, the science will be in everyone’s face. I agree with KT – the “core” areas are a sham – totally infeasible given bighorn migration and the landscape/use. I don’t see how a collaborative or a kumbaya will accomplish bighorn viability given the posture of the politicians and livestock industry group, the proximity of the land use, and the reality of disease transmission from domestic to wild sheep – bighorn viability ought be the standard for success – it’s the law. You are too kind to the sheepmen The sheepmen lamb very early and what they really bring onto public lands each summer are ewes with lambs that are nearly full grown, which means they get to graze 15 sheep for $1.35/month(five ewes plus two grown lambs each). That equals $.09 for a sheep per month. The forest service and BLM are so short staffed, that they often rely on the “honor system” and allow the sheepmen to provide them with number of sheep they bring to their allotments. It would be interesting to actually count the sheep and see how honest the woolgrowers are. Larry: You are right ( and I believe my math before was off a bit, too …). Do you know if that is what the Dubois Sheep Station operation on public lands does? Turns out blimpy “lambs” on the public lands? And thinking of that just jarred my memory. I just remembered that Butch Otter has oversight – and in a way ultimate control – over domestic sheep herds that spread a trail of pathogens from the southern Lemhis Northeast into Montana. Yet another subsidy to the Woolgrowers is a great big federally funded tax dollar drain of a USDA “Sheep Experiment Station” in DuBois. Unfortunately, the “experimenting” is not confined to the USDA Dubois Sheep Station lands. No indeed. These sheep are also run as welfare public lands sheep, under BLM and Forest Service grazing permits, because the USDA just can’t afford to feed them, or something. BUT the University of Idaho OWNS the domestic sheep. And, like Larry says, may pay as little as nine cents per month per animal to do this. 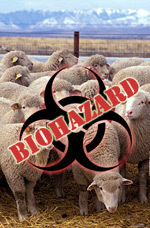 AND that photo of the sheep with the biohazard sign over them? Those are some of the DuBois sheep of Butch Otter’s – from the wikipedia page on sheep! BLM and the Forest Service have been cutting all kind of special grazing permit renewal deals for these University of Idaho sheep, including shunning any real analysis. The Forest (I believe it is the Caribou-Targhee) used Categorical Exclusions in Kelley, Snakey and one other allotment to renew permits – thus skirting environmental analysis. The Lemhi Range has great bighorn potential, but unfortunately the University of Idaho herds are a very serious problem in having any viable bighorn populations there. Plus causing other problems too. The Bernice allotment (near INEL and the southern Lemhis) is grazed by the U of I sheep in the winter – so the disease-vector domestic sheep are out there when conflicts with all kinds of wintering big game are maximized. So at the same time that Fish and Game puts out PR blurbs about “not disturbing wintering wildllfe” here we have an Idaho state herd under Otter’s ultimate control with large numbers of domestic sheep, sheep herders, dogs, etc. running all over big game winter range devouring shrubs and grasses wildlife need in winter – and disturbing and displacing wintering wildlife. There has NEVER been any NEPA analysis of the very large adverse ecological Footprint – including of disease, predator conflicts, and the trashing of the land that extends into Montana– by this Idaho state herd. AND what about predators? Are predators slain for their benefit too? As a result of litigation by the Center for Biological Diversity and Western Watersheds Project, the DuBois station right now is conducting an EIS where it will be required to examine the impacts. Of course, you can bet the initial effort will be chock full of lies from the U of I, too. How many lies will be ginned up by the U of I in this effort? AND last, what do you bet that if the new Siddoway Bill, that contains very bad provisions is passed by the Legislature, Fish and Game will be browbeaten to NEVER consider the Lemhi Range as Core bighorn habitat? The U of I DuBois sheep are the PRIMARY domestic sheep herds remaining in that 60 mile long wild mountain Range, except for one very herd in an allotment near Goldburg in the Upper Pahsimeroi that the Idaho BLM has been refusing to close. FNAWS actually appealed the grazing permit re-issuance there, but BLM to my knowledge, continues to allow a few hundred domestic sheep to trump all other uses of the public lands (I believe it was the Bear allotmt, but am forgetting exactly right now). If the state of ID follows the federal example, “core” habitat will only be that which currently has BHS present. It’s not enough to just try to protect the wild sheep that are hanging on- there has to be allowance to let them increase in number and expand in range to fill up suitable habitat. The U of I sheep at the experiment station get wool and meat subsidies as well as free range. They also allow the Idaho Woolgrowers an excuse to keep sheep grazing allotments open on public lands when no private operator wants to use the allotment. Something I never thought about before, since sheep are not branded, how does one tell WHOSE sheep are actually being grazed? Does anyone know? Regarding the allotments I mentioned in a preceding comment, BLM’s geocommunicator site allows people to see where an allotment is located, if anyone is interested..
AND it is an interstate biohazard. Since these sheep cross statelines, shouldn’t that trigger stricter federal oversight? I wonder how the state of Montana feels about the the U of I flock potentially keeping bighorns from living in otherwise suitable habitat? it looks like ICL may be looking to walk out of the “collaborative” anyway … good for them . Indeed the latest Siddoway Bill spin-off is b-b-b-a-a-a-d to the bone! HERE is Info on the University of Idaho welfare public lands domestic sheep operation under Butch Otter’s control that sprawls across Idaho and Montana, directly conflicting with wildlife from bighorn sheep to grizzly bears ot Canada lynx to sage-grouse. Notice the bighorn sheep sightings in the Bernice allotment. These are excerpts from the Complaint filed by Center for Biological Diversity and WWP. Now NEPA analysis is being done, and the Comment period is Open. The USSES has its headquarters located in the upper Snake River plain at the foothills of the Centennial Mountains, approximately six miles north of Dubois, Idaho, where it maintains a 27,930 acre ranch, including residential and office buildings, research facilities, and lands used for grazing. USSES owns two additional ranch properties in Idaho – the 2,600 acre Humphrey Ranch near Monida, Montana, and the 1,200 acre Henninger Ranch near Kilgore, Idaho. USSES also owns about 16,600 acres in the Centennial Mountains of Montana, which it uses for summer grazing and rangeland research. In addition, USSES grazes sheep on four allotments on the Caribou-Targhee National Forest totaling over 32,000 acres, and grazes sheep on a Bureau of Land Management (“BLM”) allotment in the Upper Snake River District. In total, USSES utilizes over 100,000 acres of publicly owned land, including about 48,000 acres managed directly by USSES and another 56,000 acres managed by the Forest Service and BLM. These lands are geographically diverse, including subalpine meadows, foothills, sagebrush steppe, and desert shrubland ecosystems. Over half of the 100,000 acres is located within the commonly used boundary of the Greater Yellowstone Ecosystem. In addition to authorizing sheep grazing across the public lands that it directly administers, the USSES also grazes sheep on four allotments on the Caribou-Targhee National Forest in eastern Idaho: Meyers Creek, Kelly Canyon, Snakey Canyon and East Beaver. The USSES also grazes domestic sheep on the Bernice Allotment, which is administered by the BLM”s Upper Snake River District in Idaho. The allotment, which is 22,687 acres, is located approximately 4 miles north of Howe, Idaho, in Butte County. The Bernice allotment is crucial pronghorn winter range. Portions of the allotment lie within 4-5 miles of winter habitat for a small herd of Rocky Mountain Bighorn sheep. A flight conducted in March, 2000, by the Idaho Department of Fish and Game found six bighorn sheep within the northern part of the Bernice Allotment. The BLM prepared an environmental assessment for the Bernice allotment in 1999, and issued a three-year grazing permit for the allotment in 2000. The permit was explicitly limited to a term of only three years due to a protest and concerns raised by the Idaho Department of Fish and Game regarding the adverse impacts of domestic sheep on nearby bighorn sheep populations. The grazing permit for the Bernice Allotment has expired, and BLM has not reissued the permit, nor has BLM conducted further NEPA analysis. USSES continues to graze sheep on the Bernice Allotment”.